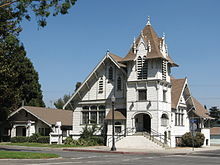 There are more than 2,800 properties and districts listed on the National Register of Historic Places in the 58 counties of California, including 145 designated as National Historic Landmarks. 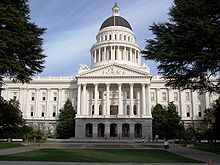 The following are approximate tallies of current listings in California on the National Register of Historic Places. 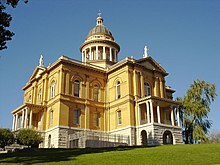 These counts are based on entries in the National Register Information Database as of April 24, 2008, and new weekly listings posted since then on the National Register of Historic Places web site. There are frequent additions to the listings and occasional delistings and the counts here are not official. Also, the counts in this table exclude boundary increase and decrease listings which modify the area covered by an existing property or district and which carry a separate National Register reference number. ^ "National Register of Historic Places: Weekly List Actions". National Park Service, United States Department of the Interior. Retrieved 2008-11-22. ^ Arroyo Seco Parkway Historic District runs from Downtown Los Angeles to Pasadena and is included in all 3 Los Angeles County lists. ^ The following sites are listed in multiple counties: De-No-To Cultural District (Humboldt and Trinity), Fages-De Anza Trail-Southern Emigrant Road (Imperial and San Diego), Foote's Crossing Road (Nevada and Sierra), Gianella Bridge (Butte and Glenn), I Street Bridge (Sacramento and Yolo), Lava Beds National Monument Archeological District (Modoc and Siskiyou), Nobles Emigrant Trail (Lassen and Shasta), Ridge Route, (Kern and Los Angeles), Russian Village District (Los Angeles and San Bernardino), Shorty Lovelace Historic District (Fresno and Tulare), Sulphur Creek Archeological District (Shasta and Tehama), and Tower Bridge (Sacramento and Yolo). 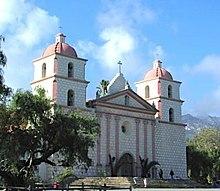 Wikimedia Commons has media related to National Register of Historic Places in California. This page was last edited on 16 April 2019, at 12:30 (UTC).